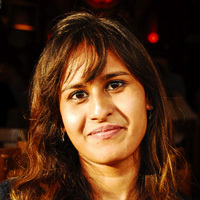 Udita Banerjee works in Marketing by day and is a creative writer by night. When she’s not at the Fringe, she’s poking around in charity shops and second-hand bookstores. Travels have taken her from surviving a supercyclone in 1999 to featuring on the cover of a Scottish Book Trust anthology in 2013, both of which are excellent ice-breakers. Some of her favourite things include old books, pressed flowers, and the drama of Edinburgh skies.